Friends, we gained another family in Santa Elena Belize! Uniting with the people of Rios de Agua Viva church to serve, love, and reach out to the people living around their church community; and to share Jesus over and over with different families was incredibly beautiful. 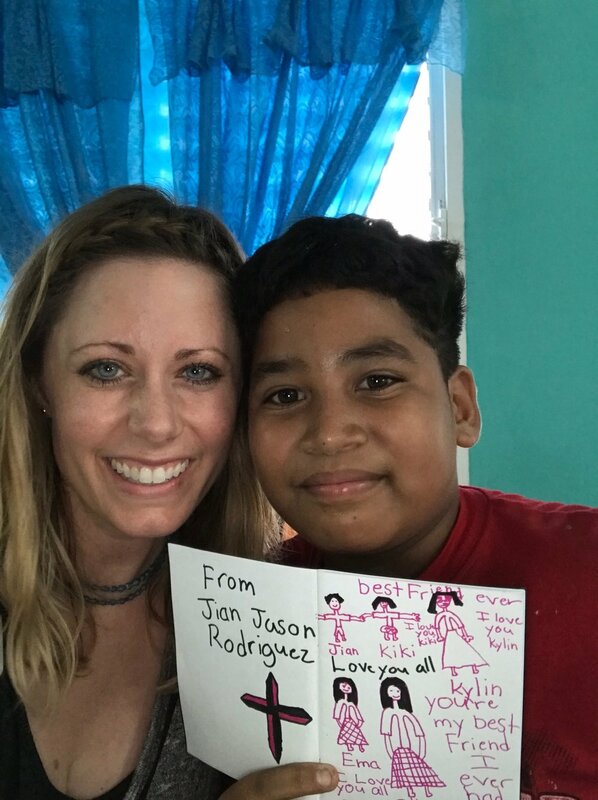 There are so many “God” moments from our Belize trip that still warm my heart and bring me so much joy. As I spoke on the Sunday that we returned, the people of Rios de Agua Viva church that God connected us with embody a joy and peace that is transcending. As we were packing up to leave for Belize, and leave our two little girls for 8 days, I was dealing with so many emotions in my heart and multiple questions raced through my mind. Where were we going, where would we be staying, who would we meet, what would it look like, how would God use us there...????? Little did I know then, God’s plan was for us to meet a family there in Belize. As we arrived, in the dark and rain, the children stood watching from the church doors, waiting in anticipation for our arrival. The sweet ladies of the church prepared a meal for us and they welcomed us with an engaging and exciting service. Everyday God drew us closer to these brothers and sisters in Christ. We saw Jesus in the way they cared and cooked for us ALL DAY LONG, how they took time off from their jobs to be there and serve us, how they celebrated Kinley’s birthday with us, and also in seeing their gift of hospitality and hearing about the thoughtful planning beforehand to prepare for our arrival. That they even built the rooms where we were to stay, plus the two showers we shared. All of this fruit comes forth through people living the most simplest of lives, with barely their basic needs being met, truly with much less than we have here stateside. In a span of six days they conducted four church services. We learned so much by watching the way they worshipped, watching the way they responded to the messages, and we loved listening to them pray together. We saw Jesus in the way they loved us through hugs, laughs, tortilla making, and through their worship. By the end of the trip, God had filled our hearts with so much love for these people, that tears filled our eyes as we hugged them goodbye. We thought goodbye was at the church the night before we left, but these sweet people woke up early (5:00am) to make us “Johnny” cakes and ride on the bus with us for three hours to Belize City. And not only that, but they stood on the steps waving goodbye, and blew kisses as the water taxi pulled away. Although today we are miles and miles apart, God has woven us together and we are so happy to stay connected and look forward to going back and working alongside these sweet people again, uniting in building more of God’s Kingdom. Thank you for all of you that supported us on this trip through prayer, encouraging notes and letters, and also through financial support. We all felt the love and prayers daily! Thank you for allowing Lance and me to go and serve with Team Belize. We are incredibly blessed to be a part of a SENDING church! Seeing God work in every aspect of our trip strengthened my faith. We were kept safe throughout all of our travels and we were kept healthy. VBS was very successful. Even though our original service project got canceled due to the rain we were still able to serve the church by painting and digging out their drainage ditches. The home visits were just as meaningful to us as they were to the families we went to love on and serve, in fact - they blessed us. Even the one house where the enemy was attempting to cause trouble, God was still at work through His perfect timing. The home visits whereby we brought food and supplies to the local families and getting to pray over them was very special. Hearing their stories and seeing the ways they responded to what God was doing for them that day was inspiring! My single favorite moment was sharing God's love and encouragement to Felipe. Despite the language barrier you could see his understanding of what we shared, and his brokenness. And we were most encouraged when Felipe showed up for church the next day. We have also been told that since we left he has continued to attend church. Praise God! Stepping out of our comfort zone, stepping out in faith was a daily occurance - at some point during the trip, several of us found ourselves sleeping on the hard floor. The days were hot and muggy. Some were asked to do things that they were not comfortable with. Some had to conquer fears of speaking in front of others, some had to conquer fears of flying, some had to conquer fear of heights. God was there in the uncomfortable. What was my big “take away” from our trip? We must make the time to immerse ourselves completely in the Lord! When we do, He will use us in so many ways and bless us in so many ways that one cannot even imagine! When we leave our “comfortable,” and allow God to use us, protect us, provide for us and guide us; In a place where we must completely rely on God, our eyes will be opened to the needs of the world around us. And, it exposes how much we have that are “wants” and not our basic needs. At times, when we are in the comfort of our nice homes, lying in our warm beds, eating our food or watching our TVs, we can forget (or ignore) that there are those around the world and even in our own country that are in need. God has called us to be His hands and feet. God has called us to give to the poor. God has called us to look after the orphans and widows. God has called us to take the Gospel to all nations. God has called us ALL to do this. But we must be willing and we must be obedient. Are we grateful that we are on the side that can help and not on the side that is in need of help? What are we going to do about it? My hope is that you do not feel judged or condemned by what I've said but that you feel encouraged and challenged to step out in faith! We say we want to be the salt and the light of the world. Let's put our words and faith into actions! Thank you to all who supported our trip to Belize! Whether that was through supplies, financial support or prayer, this trip would not have been possible without you! Help us build on what God did in Belize by serving our community here in the same way. If you know of any families in need, have any service project ideas or want to offer your time, talents or treasures, please contact me at missions@friendshipcreekside.com any time! Thank you and God Bless! It was 5 a.m. on July 5, 2018. My alarm went off, I rolled out of bed, showered and got dressed for a long day. At this point all I could feel was excitement and wonder. I wasn’t sure what to expect or how everything would unfold. This would be my first international mission trip, as well as one of the few times there would be no set schedule for what each day might look like. For me this was a little uncomfortable, but I did have within me a sense of peace. It wasn’t my job to worry about what was next. It wasn’t for me to stress over a schedule telling me what to do moment by moment. I was able to live in the moment of what God had for me right then, not worry constantly about what was coming next. Right then, the moment was about being excited for what did arrive. The team left early that morning and headed to Houston. The road trip was a road trip. The airport was the airport. Belize was something else. Looking out the airplane window and seeing the lush green country with massive rolling hills and villages was an entirely new experience. Wondering what we would get to see, who we would get to meet, the stories we would hear and be able to tell. Little did I know that those stories would begin even on our first night in Santa Elena Belize. The rain was coming down heavy from the moment we exited the airport that first night. We rode on the Mesh Bus line Bluebird for somewhere around three hours and arrived to our destination a little later that expected (it sure didn’t look anything like the Belize tourist photos in brochures). We stepped off the bus and were immediately met with the most welcoming faces I had ever seen. In all of two seconds we were overwhelmed with the joy of the Belizean culture and in the hearts of these people. Stepping off the bus, we walked straight into the building and dropped our bags, then headed directly over to the sanctuary - the one room the church had for services. During our first meal in Santa Elena, with Corby on my right and Lance on my left, we were greeted by some of the families from the church. Behind us sat a family of 5 - Brian Michaels, his wife Rose, and their three kids Brian, Michael, and Catalia. We spoke with them for a brief minute and met some of the other people around them. Service began and the night progressed as someone had planned for it to go. Throughout the week, the stories I mentioned earlier, came pouring in. One of them impacted me more than most. The story of Brian Michaels and his beautiful family. While we were there, the church had four services and during each one I ran into Brian and his family (it was like a divine appointment). I assumed they were a family rooted in the church because they were so present at everything. Come to find out, this was not the case. Pastor Felix gave us a list of families to pray over long before we left for this trip. Each family had a specific need and this list was carefully put together and prayed over before the names were added. Once we got this list, we began praying over each name as a team. Our prayer was that God would supply exactly what these people needed and that, if He so willed, He would use us to make that happen. Just as God does, He decided to change some of the names on this list. One of the names taken off was replaced with Brian Michaels and his family. Someone from the church had run into them and had put them on the list. Their prayer was that this family would begin coming to church and meet Jesus. The Michael’s family first night being in a church service was the night we arrived in country. Each night from then on, Brian brought his family to church and each time they came he seemed to make his way to me. I heard stories of his rough past, of his family disowning him for his choice in a bride, about his house being built in a day, how he finds work, his kids having to sell stuff to find food each day, and so much more. I could spend hours telling about each thing he told me about his life, but one thing he said is at the forefront of my mind. Brian told me that he wasn’t sure why, but for a few weeks he had felt this odd desire to take his family to church. He told me about his prior life and the violence that came along with it and how he didn’t want his kids to have any part of it. He wanted his kids to experience a life of peace and the only way he knew to make that happen was to take them to church. Growing up, Brian had known nothing but violence, alcohol, and the party life. Though he no longer takes the time to go to clubs and parties, he still has the desire in his heart. As we talked, I explained to him his job as a father and how you often have to leave childish things behind in order to lead your family in a Godly manner. I expected him to get frustrated with me and potentially even walk away. Instead, Brian drew closer. He told me had had this urge to leave all of those things behind for the past few weeks and how he wanted to learn what it meant to lead his family. I understood exactly where that urge he talked about was coming from. On our last full day in Santa Elena, we did home visits. We filled bags with things families would need, then visited each family on the list Pastor Felix had given us. The third or fourth house we visited was Brian’s. I quickly realized why he was able to build his house in one day. We stopped the bus, got off, and began walking up the hill to this tiny little structure made of recycled tin and whatever wood might have been laying around. We were first greeted by a massive pit bull named Rebel and shortly after that Brian’s family came out to meet us. The excitement on Rose’s face was uncontainable and the kids were completely shocked that we had come to their home to see them. They gave us a tour of their home, which was heartbreaking. This family of 5 lived in a lean to shack held together by zip ties, tape, and whatever else Brian could find to hold it together when he was building it. The house had two rooms inside. One was a sort of kitchen area with a little bar and handmade stools for the kids to sit on to eat and the other was just an open area with some blankets - which I’m assuming was a bed room for Brian, Rose, and Catalia. The two boys, Brian and Michael, both slept outside in hammocks that were made of rope and tied to poles that were stuck in the ground. The roof of their home was made of rusted tin, some of which had holes, the tin overlapped to provide some type of shade and shelter from the rain. All of this was constructed over dirt floors packed down with the kids bare feet as the ran inside and out. Outside and across from the door was an open fire cook area for Rose. Just behind that was the outhouse where the family could “get to it” during the night if they needed. To the right of that was another little shed which I assume would be the shower once they got running water to it. To the left of the outhouse and cook area was a little basketball goal the boys had build out of old plywood they scrounged up from dilapidated structures around town. Last was the garden where Rose could grow vegetables and legumes to feed her family when they couldn’t afford to get meat from the market. To us this house seems unlivable, but to the family that lives there it is perfect. The joy these people had was unbelievable! We look at them and talk about how sad it is that they have to live in these conditions, but to them it’s all they know. The life they know is very simple. They worry about their basic needs for today and let tomorrow figure itself out. The way they see life is almost completely opposite to how we view things here in America. Their main concerns are family, shelter, and food. We worry about houses, jobs, cars, clothes, status, and things that ultimately have no meaning in the end. We overcomplicate things to the point of becoming anxious, depressed, fearful, and angry. We get so focused on things that do not matter that we completely sacrifice the things that do matter. This family taught me so much in such a short amount of time. But the story doesn’t end just yet. Later that same evening, Brian brought his family to church again. This time they sat closer to the front than they had before. Pastor Felix gave a message, Corby shared some things, then each of our team members had a chance to say a few words about our experiences. We finished the night up with a song and Pastor Felix came up and decided to do an invitation. Almost as soon as he started sharing the Gospel Rose stood to her feet and walked straight up to him. She wanted to really know this Jesus he had talked about, and his “hands and feet” she had seen working throughout the week. I looked over at her husband who, had it not been for the sleeping 4 year old in his lap, I am certain wanted to ask the same thing of Pastor Felix. What is insane for me to think about is the fact that prayer is the power here! That 15 people God calls to “GO,” the FCF prayer team, and a special night of corporate prayer dedicated to this trip, from thousands of miles away could pray for a family they didn’t know, and the Lord in His kindness and grace would allow that family to feel those prayers. To experience the Holy Spirit drawing them in and softening their hearts, so that they could know Jesus. If there were a moral to this story, I guess it would have to be that prayer is powerful! The Lord answers prayers! Pray earnestly and faithfully, expecting Him to answer. As we pray together, the Lord hears us and sees our hearts.